Welcome to Thompson Audi's website. Here you'll find all the information you need to make an informed purchase of a new Audi, or used car truck or SUV at our Waterville, ME car dealership. If you're looking for an Audi Dealership near Lewiston, Auburn, Skowhegan, Gardiner, Boothbay Harbor, Bar Harbor, Ellsworth, Rockland, Brunswick, Camden, Belfast, or Augusta stop by Thompson Audi where you'll get a great price and service! Have questions? Give us a call at (888) 865-2351. While you're visiting our dealership's website, take a look at our inventory of Audi vehicles, including the new Audi models like the A3, A4, A5, A6, A7, A8, Q5, Q7, S4, S5, TT, and R8 for the Augusta Region. Thompson Audi is a leading provider of new and used Audi cars to Central Maine thanks to our quality automobiles, low prices, and superior sales staff. We encourage you to come and visit us at 347 Main St in Waterville, ME to view our selection of luxury and sports cars in person, speak to a sales professional or take a A3, A4, A5, A6, A7, A8, Q5, Q7, S4, S5, TT, and R8 for a test drive. Call us if you have any questions about a new or used Audi vehicle that we can answer for you. Thompson Audi's used vehicles are carefully inspected by our technicians to guarantee quality for our Central Maine area customers. We are continually receiving vehicles for our used car inventory, so check back often. Visit our inventory page to browse through our current used car inventory. If you see a used car you like, give us a call or stop in and see us at 347 Main St in Waterville, ME. Do you need assistance with a new vehicle or used vehicle loan or lease? The Thompson Audi finance team has you covered. By working with a network of financial institutions for a car loan, we make our customer's dreams of owning an Audi come true. Get the Audi car loan or Audi lease that you desire by completing our online finance application. We offer professional Audi car repair at our state-of-the-art service facility. Thompson Audi's car repair experts will diagnose your vehicle's problem and make a repair as quickly as possible. Schedule Audi care repair and Audi service in Waterville, ME by calling us at (888) 398-6773. Thompson Audi also has a stocked inventory of Audi auto parts to repair your car, truck or SUV. Our authentic car parts will keep your vehicle running like new for many more miles to come. We hope to have the opportunity to meet you soon at our Waterville Maine Audi dealership. Our helpful staff is always available to answer any question you may have about purchasing a new or used car, financing, repair or car parts. Call Thompson Audi today or stop by our dealership located at 347 Main St. We are ready to serve our customers from all over Central Maine including Waterville, Lewiston, Auburn, Skowhegan, Gardiner, Boothbay Harbor, Bar Harbor, Ellsworth, Rockland, Brunswick, Camden, Belfast, and Augusta. 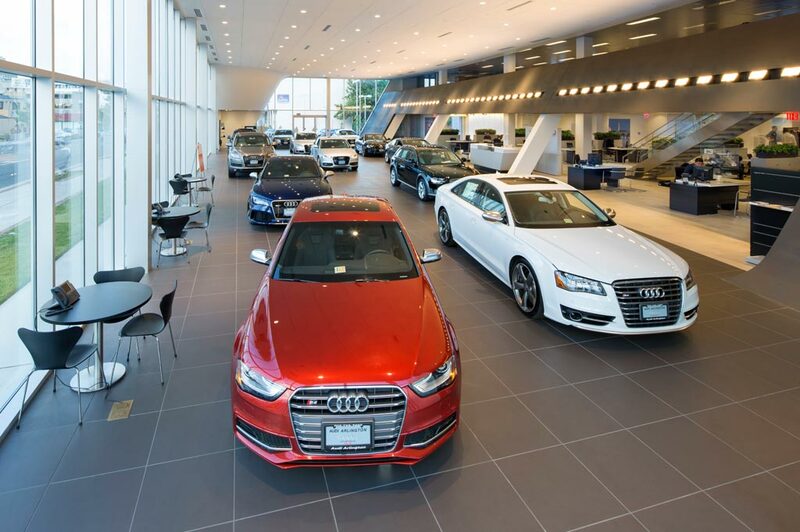 Thompson Audi in Waterville, ME treats the needs of each individual customer with paramount concern. We know that you have high expectations, and as a car dealer we enjoy the challenge of meeting and exceeding those standards each and every time. Allow us to demonstrate our commitment to excellence! Our experienced sales staff is eager to share its knowledge and enthusiasm with you. We encourage you to browse our online inventory, schedule a test drive and investigate financing options. You can also request more information about a vehicle using our online form or by calling (207)873-0777.